Oppo has announced the new selfie-centric smartphone with a notch design at the front like the Apple iPhone X on March 26th, 2018 at an event held in Mumbai. 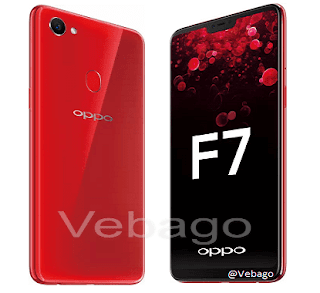 The Oppo F7 smartphone runs on the ColorOS 5.0 based on Android 8.1 (Oreo) operating system out of the box and is powered by an octa-core MediaTek Helio P60 chipset with ARM Mali-G72 MP3 GPU. The device features a metal body and also has a fingerprint sensor which is placed at the back of the smartphone. The smartphone sports a 6.23-inch Full HD+ 19:9 IPS display with a resolution of 2280 x 1080 pixels. The Oppo F7 comes with a 16MP rear shooter that helps to capture beautiful images and videos. There is an LED flash at the back of the device which allows you to shoot in low-light conditions. On the front, there is a great 25MP selfie snapper with f/2.0 aperture for capturing stunning selfies and also helps in video calls. The smartphone is equipped with a 3400mAh battery. The Dual SIM (nano + nano + microSD) smartphone comes with two storage variants, 4GB RAM with 64GB internal storage memory and 6GB RAM with 128GB storage, which can be expandable up to 256GB via a microSD card. The device measures 156 x 75.3 x 7.8mm and Weighs 158g. Connectivity options on the device include Dual 4G VoLTE, microUSB 2.0 port, WiFi 802.11 ac, Bluetooth v4.2, and GPS. The smartphone comes in Red and Silver color options with a 4GB RAM and 64GB internal memory which is priced at Rs.21,990. There is also a Special Diamond Black Edition and another Red Variant with 6GB RAM and 128GB storage which is priced at Rs. 26,990. The Oppo F7 smartphone will be made available via Flipkart online store and other offline stores starting from April 9th.